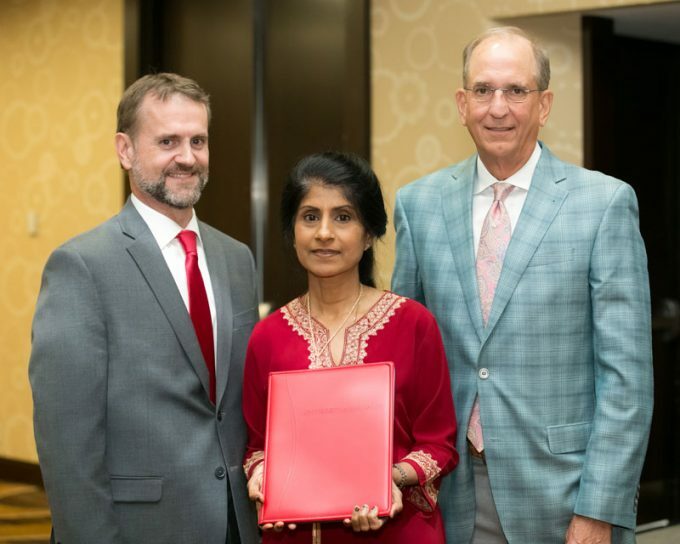 In honor of Bauer College Dean Latha Ramchand’s service to students, the Bauer College Board announced a scholarship endowment to support student success. From left, Senior Director of Advancement Bob King, former Dean Latha Ramchand and Bauer College Board Chair Paul Peacock (BBA ’81). Bauer College Board chair Paul Peacock (BBA ’81), retired partner for PricewaterhouseCoopers LLP, unveiled plans for the Dean Latha Ramchand Scholarship Endowment at a farewell celebration for Ramchand this week. Established by the board, the endowment has been bolstered by contributions from faculty, staff, business partners and friends of Bauer College and will support undergraduate and graduate Bauer students with renewable scholarships based on need and academic merit. Throughout her career at the University of Houston, Ramchand has demonstrated a commitment to student success, championing opportunity for all students, he added. Under her leadership, the college focused on initiatives to support student service and faculty research, launching the Bauer in D.C. Fellowship Program, the Working Families Agenda and several degree and certificate programs. The college also developed new initiatives to connect to the community, including startup accelerator RED Labs and the SURE™ Program.